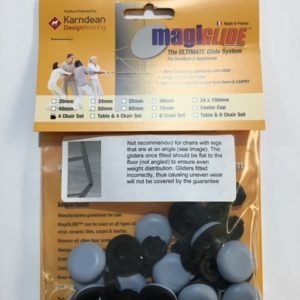 The MagiGlide 30mm Round Self Adhesive floor protectors will help you move heavy furniture and appliances easily whilst providing perfect protection for various types of flooring. With the help of these practical gliders you will be able to move pieces of furniture of up to 600 kg, smoothly and silently. 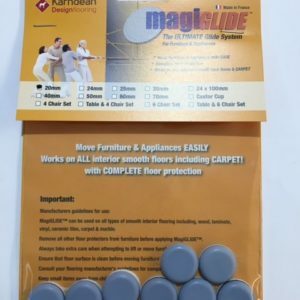 Tough and smooth at the same time, the gliders will protect solid wood floors, ceramic tiles, marble surfaces, and laminate flooring. 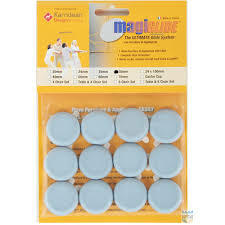 The self adhesive pad is easy to apply; just make sure that the feet of the furniture are clean, dry, and that they match the 30mm round shape of the gliders. You can choose from packs of 12 or 4, to suit your needs.